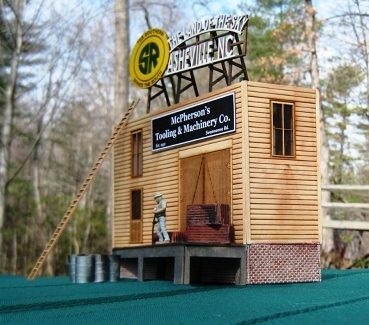 Built O Scale McPherson's Tooling and Machining Co.
Home > Built Models For Sale > Built O Scale McPherson's Tooling and Machining Co.
Price: Summer Sale! Built and Ready To Go! One of our newest models! 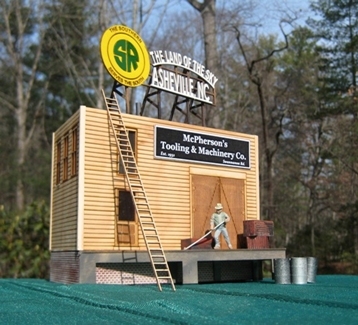 This laser-cut gem has a footprint of 7" lx 4" w x 5"h.We have crates, barrels,a ladder, and signs for this model.The top sign is available in several different railroad logos. Make the order, email us (twinwhistle@hotmail.com), or call us and let us know which railroad you would like for the model, and we will personalize the model for you.